I had the opportunity to do a phone interview with lead singer Al Barr from the Dropkick Murphys on a windy Friday night. They are doing a quick tour in November following an intensive year of touring, but this time hitting a bunch of cities not usually on their U.S. tour schedule. However, it seems we talked more about baseball than the band. SLUG: You guys have had a really great year, it's been really busy, you have a new record out, all sorts of touring going on. Tell me a little about this past year for you guys. Al Barr: Yeah, we've just been touring on the new record, y'know. Well, now it's 13 months old so it's not so new anymore. September we finished kind of a year of touring on it and we're just getting ready to do a little more touring before Thanksgiving and the holidays. That's about it. Just been touring. SLUG: What made you guys decide to do this quick November tour and hit a lot of places that you haven't been to in a long time? AB: Well, that's just it. We wanted to go out because we actually just closed down. My wife's having a second child in December and my son's birthday is in December and you got Christmas in December. Kenny, the bass player and another singer in the band, he's got two kids as well and their birthdays are in December. We shut down pretty much from Thanksgiving ‘til the New Year so we wanted to get out there and hit some places we hadn't been in a while. SLUG: Tell me about some of the highlights of touring this year. AB: We've been, y'know, all over the country. We've been to Europe a bunch of times. We've been to Australia and Japan, did Reading and Leeds, and a bunch of other festivals this summer, so we were busy. SLUG: So you guys got the holidays off. What kind of stuff are you going to be getting into in the new year? You going to be doing any recording? I understand you're writing a little, but that's probably something you guys always do. AB: We kind of try to write as you go so, that way, when you get to the point where you're ready to start working on a new record you're not just cramming. You know what I mean? But as far as the new year goes, we're real excited because we got the Big Day Out, which is a big festival in Australia, so we're planning on going to Australia for about three weeks in January, and New Zealand as well. We really love Australia. We've been to New Zealand only one other time and that was really cool, so we're looking forward to that, y'know. This band has afforded us all the luxury of being able to travel all over the world and that's pretty amazing. SLUG: And that's got to be kind of a cool thing. When you first start in a band, you do some local tours, maybe you do regionals, then a U.S. tour, then all of a sudden you guys are in a place where you're going to all these places you probably never would have thought you'd be going to. AB: Yeah, it's definitely a privilege to be able to go all over the world and have people show up to hear you and hear your band. It's a pretty cool thing for sure. It doesn't get much better. SLUG: I went up to Boston for the annual St. Patty's shows two years ago. A huge blizzard got me stranded in Philly so I missed two of the shows. SLUG: But I loved going up there when I finally made it. I got to go to the Southie parade and I fell in love with your city. I grew up in the Philadelphia area so to go somewhere like that, and be in your guys' hometown where you guys played a home game was incredible. AB: Well if you grew up in Philly, you must be pretty excited about your team being in the World Series, huh? SLUG: I'm not going to get into that yet, because I know you guys are still in mourning over that. AB: No, no...I'm alright. I got family in Philly and I've moved on from the Sox losing, and I'm supporting Philly and hoping they win. I hope they kick the crap out of Tampa. SLUG: O.K. getting back, when do you guys start planning for the St. Patty's shows? Is there anything you guys have started looking into? AB: Oh, we're already planning for it. We're already trying to figure out where we're going to do it this year and what bands we're going to have. All that. There's nothing concrete yet, but we're definitely on. Everything's going. The conversation is in the planning stages now, so we start pretty early on that. We hope to have tickets on sale before Christmas, I think. In an ideal world, that would be what we want. SLUG: And now you kind of have a base of operations with McGreevy's (bassist Ken Casey's pub at Fenway) down there on the third base line. AB: Yeah, you know, I think whenever we're not practicing, we all have to meet somewhere. We all meet at Ken's bar, so that's pretty convenient. 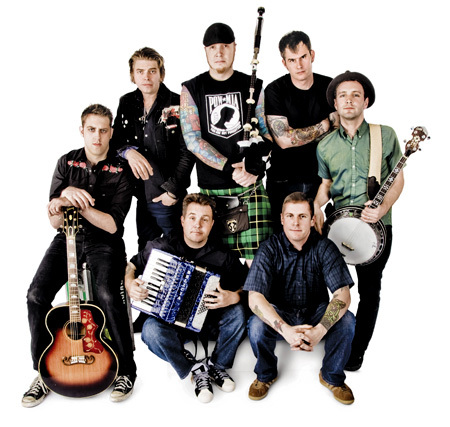 Even though Barr and the Dropkick Murphys have seen a huge surge in popularity over the last few years, they've managed to stay down to earth. Sure, Barr is proud to have played all over the world and have his music heard by millions of people, but it's the simple things in life he really appreciates: being able to spend the holidays with his family and watching baseball with his buddies. Be sure to keep an eye out for the DKM's yearly St. Patrick's Day run of shows in Boston this March (they're totally worth the trip), and get your hands on a copy of their latest album, The Meanest of Times, to get you excited for the next time they hit up SLC.